I’m very impressed with Bravissimo’s latest collection offering three plunge styles up to a J cup and a new style up to an L cup, the Oriental Bloom! I knew I had to try this one. To be honest, I wasn’t crazy about the design of this bra. Dark blue is not a good colour for me, as it tends to wash me out and I’m not a big fan of the big flower embroidery along the bust line. Still, this is the first seasonal style offered up to an L cup, giving an alternative to the Alana for those at the very end of the sizing chart. HH+ cups have additional lining for extra support, something that often annoys me. I especially dislike the fact that there is usually no picture of the modified version. Anyway, in this case, I actually like it better this way. The all opaque bra has a sleeker look than the one with half sheer cups in my opinion. In terms of fit, the cups are more generous than in the Alana. I couldn’t really capture it (you can sort of see the Alana center gore popping out on the pic), but the center gore comes up a tiny bit shorter than on the Alana. As with all Bravissimo on brand bras that I’ve tried, the narrow center gore is a godsend for close-set breasts. However, this doesnt mean the wires themselves are narrow. I found them to be slightly narrower than on the Alana and on the Harmony by Panache, but much wider than on an Ewa Michalak or a Freya bra. As for the shape, this bras gives good uplift without to much projection, resulting in a natural, neither too round nor too pointy shape, just a bit rounder than the Alana for me. But the selling point for me is that it provides excellent support and is super comfy. In fact, I’ve just ordered a second one! 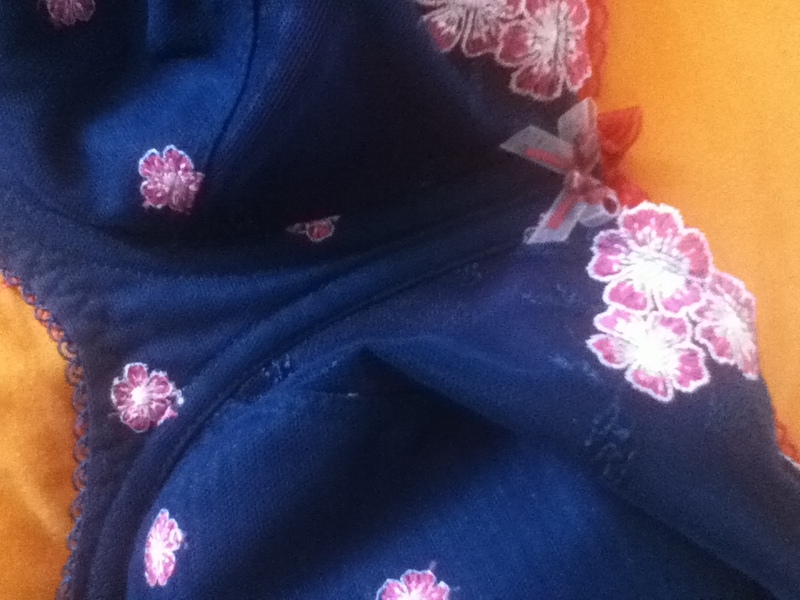 This entry was posted in Uncategorized and tagged bra review, Bravissimo, K cup, KK cup, L cup bra, oriental bloom. Bookmark the permalink. Have you tried the Daisy Chain. I think that bra is comfortable and and gives a great rounded shape. Much better than the Alana profile. I was wondering if this bra had a similar fit to the Daisy Chain. I have to make some exchanges with Bravissimo. I’ve never tried the Daisy Chain. I actually like the shape I get in the Alana, which is neither round nor pointy, more teardrop-like. This is without a doubt the best bra I have ever owned. It is exceedingly pretty, gives great uplift, has a minimising effect and is still comfy even with all of that. I wish they’d make it in like five colours, so that I could buy them all! Can you recommend any other bras that fit like this? I can’t think of another bra that fits exactly like this. It is sort of a cross between the Alana and the Boudoir Beau (both by Bravissimo) for me. Both are super comfy, but the Alana gives me slightly less uplift and the Boudoir Beau gives me a rounder shape than the Oriental Bloom.